The breach that the Bard mentions is the gap in the wall of the city of Harfleur, in medieval France, which the English Army under King Henry V held under siege. Bluff King Hal was charismatically encouraging his troops to attack the city again, even if they would have to “close the wall with English dead”… The breach that the Bards of Lanka – our Fourth Estate, those minstrels of today – could mention is a violation in protocol. The gap appears to be in the wall of the city of Halfhearted Old Hat, in modern Sri Lanka, which the armies of Good Governance are holding hostage for a just cause. Our contemporary incarnation of King Hal, characteristically bluff, seems to be urging his troops to hold the commonwealth to ransom anon – by treading the primrose path of nepotism once again. That our equally charismatic leader rendered no less a stirring speech at the UNGA event is a matter of record. In his characteristically eloquent way, waxing briefly about Sustainable Development Goals (SDGs to replace the MDGs: the Millennium Development Goals), he made the point that Sri Lanka could “summon up the blood” to “stiffen the sinews” of the world. And referring to our blessed isle’s 2,500-history, he cited the holy triad that had from ancient times made Lanka’s land green with agricultural bounty and its neighbours greener with unbounded envy. I hate to run interference with all the hype on which our present hopes are built, as much as a previous administration presented its vision in a speech at the UNGA in late September 1980. But two out of three is hardly a mark of great distinction for our noble governors who had reset the governance benchmark as high as these good gentlemen of the present dispensation of Good Governance did. Because while the rains have come (even if out of season) and the people seem content (if a tad questioning now of good men’s motives), righteous rule begs the question: is it once more unto the breach? 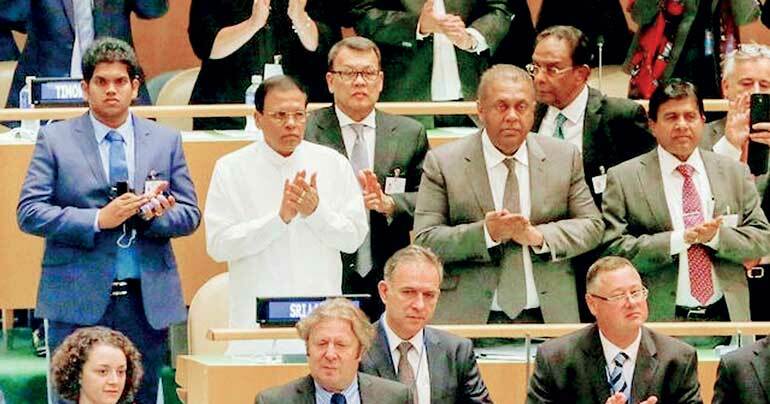 By now all of Lanka knows the Prez was accompanied to the UNGA forum by his son, who had no official standing in the Sri Lankan delegation, and that the young man in question was a visible part of the President’s entourage on the Indian leg of our leader’s tour, which creates a gap in the wall of public confidence in Good Governance. These are regrettable slips on the upward path to the siege against the old breach of nepotism and cronyism, and there are hardly any noble ways in which to interpret the President’s choices and actions. There are those who will make light of this diplomatic faux-pas. After all, a democratically elected national leader who is trusted by the people has every right to identify, select, and train the next generation of leaders, by exposing them early to the international limelight. Right? DEVIL’S ADVOCATE: The oriental monarchs of old and the eastern mandarins of modern times may be an exception to the rules of democratic-republicanism. We are still an ethnocratic monarchy. CONVENTIONAL WISDOM: Someone in the Presidential Office goofed off, and got his beloved leader in a social media pickle, which mess is now being spread around the bread of mainstream news. DEVIL’S ADVOCATE: Sophistication lacking in Presidential Press Relations is hardly the chief obstacle facing the chief executive these days. He has a hard task on his hands: balancing the baying diaspora abroad with the demands of a baleful electorate at home; juggling moderate coalition partners at home in one hand and newly re-established international friendships overseas in the other. Even the latter are not as open-handed as he/we thought, given the US volte-face on a Sri Lanka-friendly resolution – now not so surprisingly fine-tuned to be more stringent. Those with less charity and who are more cynical in their outlook will essay the suggestion that one tacit dynasty is about to begin to replace another. While the previous one was a regime that snowballed into a republic-wide family business, the one that is emerging is only divergent in terms of scope. After all, where once our global friends and neighbours thought they knew who the heir apparent was, it is now time to introduce the new pretenders (meaning, aspirants) to the throne. CONVENTIONAL WISDOM: As Namal to Mahinda, so Daham to Maithri. “Fathers of war-proof,” as Shakespeare might have muttered under his breath! DEVIL’S ADVOCATE: As MR the fall guy for Western snobbery, so MS the foil for Eastern vanities and vainglory; India, for once, on Sri Lanka’s ‘side’ in sending out a message to the global powers that be: we do things differently on the subcontinent, yaar. Least said, soonest mended. But if we’re right in our surmise that the leadership of the nation-state is deliberately moving away from the tenets of Good Governance, it could be the beginning of the end and the start of a long hard ride for coalition partners in the Good Governance administration. CONVENTIONAL WISDOM: The powers that be as a composite group – parties, factions, coalitions – are committed to Good Governance in the short term (in the long run, we are all dead... i.e. out of power, by dint of voter preferences). DEVIL’S ADVOCATE: The cracks are beginning to show. One lot have their bond scam, the other their global faux-pas. But some things are going to get a lot worse before they get better; so let’s all grin and bear it. Once upon a time, a nice set of right uncles told us they would rid the country of corruption and cronyism in politics. Now it looks like they were clearing the stage for their sons and company. Pity. There is an opportunity cost, credibility lost. Those who preached a necessary and expedient end to nepotism are now seen to be practising it. Justice must be done, and seen to be done.